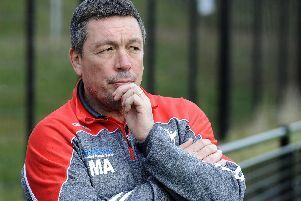 Sheffield Eagles duo Max Garcia and Mike Weldon are in line for a return as director of Mark Aston attempts to reshuffle his threadbare ranks. Aston was left fuming with his side’s display in defeat to Dewsbury last week and is looking for response on Friday against a Featherstone side who are favourites for their second victory at the OLP this season. Aston’s options are limited, but with Garcia and Weldon missing out against the Rams, the odds of a recall are stacked in their favour. “We had 19 fit players last week,” Aston explained. Garcia has been nursing an injury, but Aston says he is now fit to return should he look to bring him back into the fold. With Ryan Millar, Corey Makelim and in all likelihood Jake Spedding out for the season, the Eagles also appear to have lost the services of Jack Ashworth and Matty Costello who have been regulars all season on dual-registration from St Helens. With Saints chasing Super League glory, the likes of Ashworth and Costello have been involved at first-team level, but Aston has retained the services of James Bentley. In their absence youngster Blake Broadbent appears to have taken his opportunity, with the academy graduate set to keep his place in the 17 after impressing his coach from the bench against Dewsbury. “I thought that young Blake Broadbent came on for a big 20-25 minute stint and I thought that he was great,” Aston continued.